Inside a freshly painted brick structure in Homewood, Nate Mitchell, a master barber, proudly shows off empty space where his future customers will sit for haircuts, shaves and styles. The salon chairs and equipment aren’t in place yet. But Mr. Mitchell, 41, who has operated The Natural Choice Barber Shop and Salon in Oakland for nearly two decades, is confident his new location will draw a steady flow of business from clients who won’t encounter the parking hassles and traffic congestion that plague his shop a few miles away in the city’s university hub. It took more than a slew of free parking spots in Homewood to convince Mr. Mitchell to launch his second salon in a neighborhood better known for blight and crime than as a place for startups. He’s investing in the East End community because he believes the building he’ll occupy beginning next month will become a successful experiment in social entrepreneurship — the concept that businesses can do good while they generate revenues. The shared work space at 621 N. Dallas Ave. — which its owners have dubbed “The Shop’’ — is open to skilled tradespeople, artists, caterers, writers, scientists and anyone else who creates products and services with their hands. But unlike other co-working environments, tenants won’t pay rent. Instead, they will commit to providing at least 10 hours worth of services each month free of charge to needy people and organizations in one of the city’s poorest communities. Mr. Mitchell, for instance, will offer a free apprenticeship training program at The Shop, as well as discounted cuts and styles to children, the elderly and disabled residents of Homewood at community events and on some holidays. 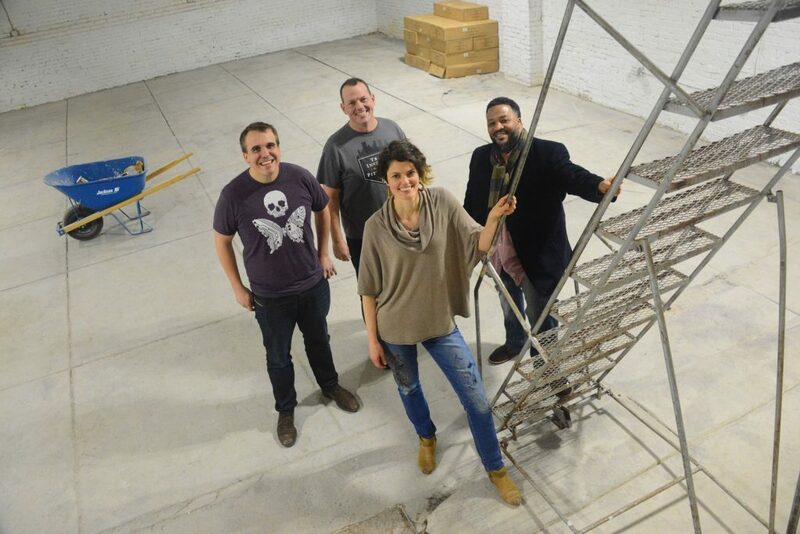 We see this as a new model for how co-working-maker-event-community spaces can involve and give back to the actual areas they exist in,” said Adam Paulisick, 35, who bought the former auto body and tow shop last year with his wife, Ashley Cecil, 36. The couple, who live in Highland Park, paid $265,500 for the 5,500-square-foot commercial building and said they expect to spend at least that amount on renovations. They will recoup some of their investment by charging for events and classes held in meeting space they are developing inside The Shop and by collecting a small fee from tenants who rent mailboxes there. Ms. Cecil is an artist and illustrator who has already set up a studio in the space where she hopes to hold classes and collaborate with other makers. The couple’s decision to buy and launch The Shop with private funds “is a labor of love,” Mr. Paulisick said. He works full time as chief product officer of Commerce Signals, a firm based in Palo Alto, Calif., and Charlotte, N.C., that provides data on electronic payments transactions for market and advertising research. He also teaches part time at Carnegie Mellon University’s Tepper School of Business and is a co-founder of Fygment Productions, which organizes meetups and programs to encourage entrepreneurship among diverse groups in Pittsburgh. One of Fygment’s events, #UnstuckPgh, held Monday mornings in East Liberty, will begin convening at The Shop this month or next, he said. “We’re trying to raise the conversation about entrepreneurs,” said Kit Mueller, who co-founded Fygment with Mr. Paulisick. Mr. Mueller is also director of strategic and community development for the Trade Institute of Pittsburgh, which is supplying some of its graduates to work on renovations at The Shop as part of a paid apprenticeship program. Mr. Mueller envisions The Shop as “a place with no barrier to entry” for people in trades and crafts and other entrepreneurs. Students at the Trade Institute — which is also based in Homewood at a business incubator at 7800 Susquehanna St. — come from disadvantaged backgrounds and some spent time in prison. They could be among future tenants at The Shop where Mr. Mueller hopes to install a jobs board allowing neighbors to post repairs and other services they need. He and Mr. Paulisick are adamant that the jobs board be “offline” because many Homewood residents don’t have internet connections. In an effort to gauge community interest and feedback on how to utilize The Shop, Mr. Mitchell, Ms. Cecil and Mr. Paulisick are hosting a free breakfast from 9 to 11:30 a.m. on Jan. 28. Among those planning to attend is Vernard Alexander, president of the Homewood-Brushton Business Association. He said he supports any efforts to recruit businesses and organizations to the neighborhood. “It’s a great idea that they will get free or discounted rent, as long as they donate something or their services to Homewood,” he said. Jerome Jackson, executive director of the nonprofit Operation Better Block, which provides assistance for development in Homewood, said it’s too early to tell how successful The Shop will be in fostering entrepreneurs and businesses. Homewood has long struggled to revive what decades ago was a thriving streetcar community with bustling business districts. A study by the Penn State Center Pittsburgh in 2015 said the community has been challenged by a high crime rate, poverty, unemployment, high student dropout and absenteeism rates, and a disproportionate number of renters compared with homeowners. But the last several years have seen a few attempts to jump-start activity. Downtown-based Bridgeway Capital in 2013 bought a former Westinghouse Electric factory at 7800 Susquehanna St. and converted it into a business incubator that houses the Trade Institute and other tenants. Two new eateries — Everyday Cafe, a coffeehouse, and 7 Senses, a catering firm that specializes in vegetarian food — opened recently on North Homewood Avenue with support from the Bible Center Church and Operation Better Block. Last week, the city Urban Redevelopment Authority gave initial approval to a plan for 58 units of new housing along Hamilton Avenue and Kelly and Susquehanna streets. For Mr. Mitchell, opening at The Shop brings him full circle to the neighborhood where he was born and raised on North Murtland Street. He said he has wanted a second salon location for long time but put it on hold for years because of the cost. To open his new shop, he is tapping personal savings and has a crowdfunding site at www.HomewoodRising.com through which he’s trying to raise $15,000 by Friday. As of Tuesday, the campaign had raised more than $11,000. Besides contributions, donors can purchase commemorative bricks for $275 that will be engraved with their names and installed at the shop’s entrance. Yes, hair will get cut, but more importantly ideas will be born to help Homewood realize its potential,” Mr. Mitchell said on his crowdfunding site.